Call to Action is Today! 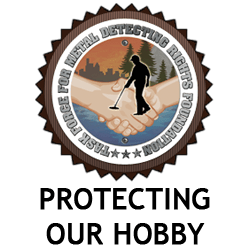 C’mon Folks–Put down your shovels for a moment, and do your part for our rights as detectorists–it only takes a few minutes to send an email. We cannot afford to be passive about these issues any longer. Don’t say it doesn’t effect you. It does affect you. Every instance of discrimination in our hobby leads to more discrimination. Click here to send that email or make that phone call!